DOES: uses you and your child's love/obsession/admiration for all things currency to tackle a notorious academic subject: the word problem. Was your child shocked when she/he finally learned that the bank pays you to leave your money with them? My son almost fainted. Overjoyed he asked, "How much do they give us, Mom? 10 percent???" My kids, especially my oldest, loves loves loves money. Not only does it bring him good things but it also is a fun subject in workbooks. The spatial aspect of money math makes him feel like they are talking his language... until.... until... there is too much of it... language, that is, not money. Everyone prefers the paper coins included in the book. You can wash real coins but it still smells. I used to cry when I had to read math word problems as a kid. I wasn't going to let history repeat itself and so I decided to duke it out with this demon by using Coin Clues. If you remember my review on Cart Before the Horse, you will remember how fun it can be to use logic to solve problems by moving discs around. In Coin Clues, it's almost like a riddle and that is what makes it fun but it is still indeed a word problem. I had a chance to chat about the concept of Coin Clues with Tim Swain, Educational Director of Mathnasium of Manhattan. Tim told me that the clues looked fun and also challenging. He really liked that the child had the option of having paper coins as visual models to look at instead of keeping track of all of it in their heads. 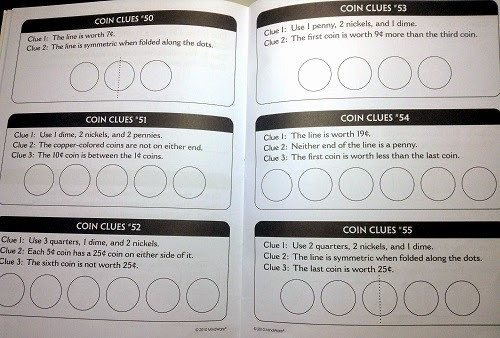 In Book A, towards the middle, the author gently phases out of telling the child which coins are to be used. It's subtle and kind and as a mother, I appreciate the gesture. There is no arm-twisting for Mr. Toys are Tools to do Coin Clues with my son. He is a regulatory analyst, so it's no surprise! He prefers to work with scratch paper and write in the numbers. Oh, if you are wondering what is on my son's face. They are temporary tattoos. I was so annoyed. Why Are Math Word Problems So Tough? "Children often have trouble with math word problems because they don't know where to start," said Tim. "Helping them create and identify a plan of attack is very important and can be cultivated at an early age." Tim would know as he spends everyday, tutoring math students who are both gifted in math as well as those who struggling to catch up to their peers. Tim encourages students to "take stock" of given information and figure out what the problem is really asking. According to Tim, these are key skills that students sometimes take for granted and skip over until they realize how important they are. YES. YES. YES. This has happened in this house - over and over again! After he writes in his answer (since coins do not stick to paper), I will initial it to show that I checked it. He loves that reinforcement. Eventually, I will give him the answer key and let him check himself. 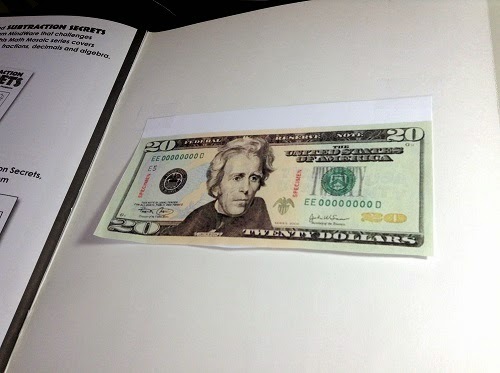 Book B uses half-dollars too! I think that is the first time my kids saw one! 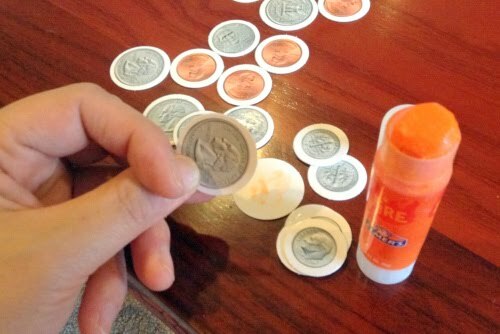 You get the back and front of the coin and if you glue it, it becomes really sturdy. "A child knows that coins have value and that they are something that parents and adults use in real life, so it makes it fun and relevant to work with them," Tim said. 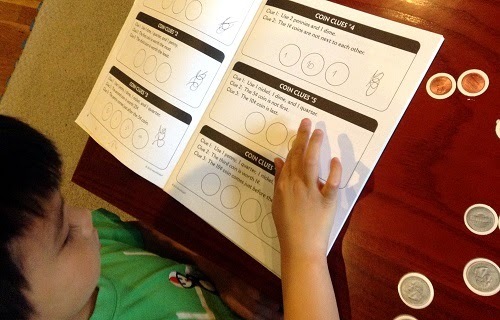 Tim also felt that coins, because of their different sizes, colors, and textures, also lend themselves well to early reasoning and ordering activities. Ordering? I know ordering very well. My youngest son LOVES order. He is currently trying to memorize the entire NYC subway map and he will likely be successful by the time he graduates from elementary school. I also thought that he is not that great at spatial math but when I gave him Coin Clues Book A, I was so surprised how well he was doing. The sequencing aspect was very motivating for him! With tangible and colorful thick paper coins (because real ones are way dirty), a child can be more motivated to tackle word problems. 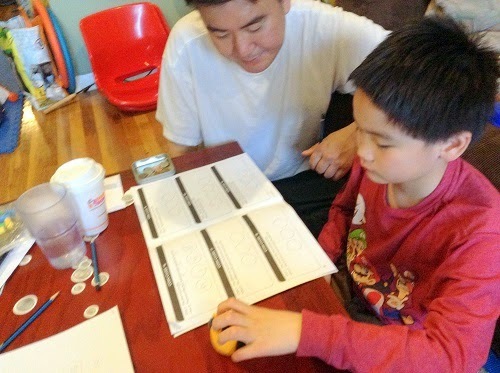 Tim felt that these clues really helped a child build good problem solving techniques. 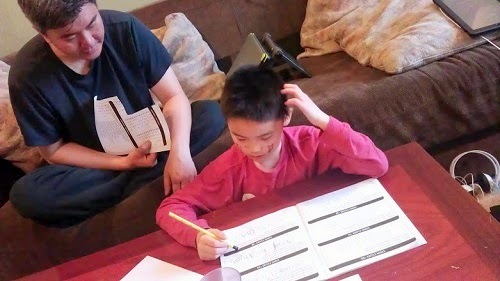 I thought that was great because it was my goal all along for him to be more comfortable with math word problems because he's generally good at math and I want him to continue feeling confident about that. For kids who excel at reading but may not be so excellent with math, I think Coin Clues is going to be great for them too. Just as the coins and numbers will be a sight for sore eyes during math word problem time, the image of words and letters will be comforting to those with better reading abilities. But at the end of the day, all the children will be better at math. Can you not think of a kid-friendlier stay-sharp-during-summer-"workbook"? (I think it's more of a "puzzle book") I don't know about you but I have a feeling that I will only find workbooks this fun on Mindware.com. So please enter the giveaway and help me find the next best summer workbook EVER!!! In keeping with the theme, here's a representation of what they get when they finish awaits at the end of the book. PSST... newsflash, this morning, I just got an email that "created by Mindware products" will be 20 percent off until 5/28/13!! CODE: MW1320 What luck! Mindware makes their own toys and books and also sells products from other companies. You can tell it is Mindware-made by the little brainy guy logo. Here is the link to get started. If you are new to Mindware, the links below are to my favorites that I've reviewed or will be reviewing. Q-BA Maze 2.0 Big Box - ze best! 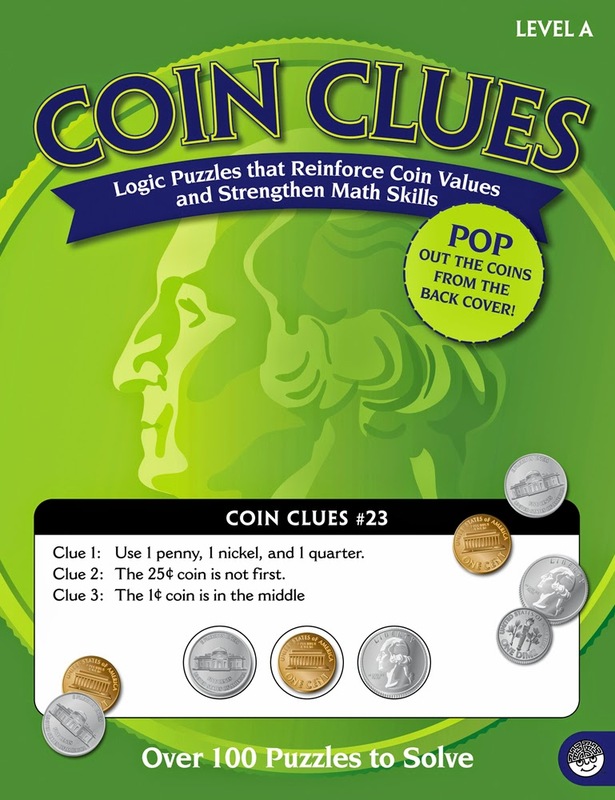 And now here's your chance to win your very own Coin Clues Books (Your choice of two of the three mentioned above including Coin Clues Making Change)! Just fill out the Rafflecopter form below! Disclosure: Toys Are Tools was not compensated by the manufacturer of this product to publish this review. The products were submitted to testers to facilitate the review process. Reviews are never promised. yes, i do think that math word problems should be taught during Language Arts; kill two birds with one stone, no? I am a homeschool Mom and have seen that the more lessons you can fit into one study session, the better, IF your child can follow along! My son probably would get mad at the author if he snuck in something that didn't look like math in the math section, kind of like the peas creeping into the mashed potatoes, but I'm all for bringing in the whole picture if it helps get the point across!!! Chicken pot pie anyone?? I like the Coin clues a lot! Perhaps starting children early (preschool/K) with verbal math problems would be a start in building their comprehension of such problems so that they are effectively able to understand and solve them. I could see an organic, natural way to incorporate "word problems" into the everyday tasks of cooking, shopping, and saving/spending.